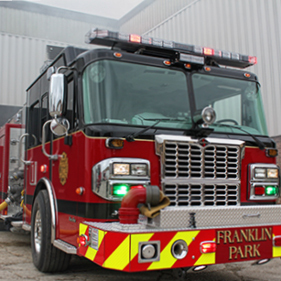 One of the most important means of maintaining the highest level of professionalism in the Franklin Park Fire Department is through ongoing education and training. Professional development for the individual fire fighters, and for the department as a whole, is a continuous and complex responsibility for the Command Staff. Among its many facets are recognition that the fire service constitutes not only a job, but also a profession. The fire service has its own unique body of knowledge, orientation toward community service and commitment to a set of ethical standards. Professional development also involves the promotion of development opportunities through professional associations, meetings, internships, and a formal education and training curriculum. Many members of the department have chosen to further their education by entering into Associates and Bachelor Degree programs. Others have chosen to join one or more of the specialized teams throughout MABAS Division 20. The Command Staff strives to provide each member of the department the opportunity to reach not only the department goals, but also the firefighter's own personal and professional goals. Taken together, professional development and training are the corner stone of an effective and well-managed fire service organization. The Command Staff (Fire Chief and Battalion Chiefs) strive to provide each member of the department the opportunity to reach not only the departments goals, but also the firefighter's own personal and professional goals. Taken together, professional development and training are the cornerstone of an effective and well-managed fire service organization. To that end, our Department leads by example by not only hosting and teaching classes for our members, the Division, and offering courses to all outside agencies, but by our Command Staff attending courses at the highest level. All Command Staff currently have obtained or are achieving the State certification of Chief Fire Officer, the highest level of Fire Service certification offered in the State of Illinois.